Community Blog by coffeewithgames // Mega Man 9 - How many hours have U.S. Wii owners reported playing? Mega Man 9 was released for Nintendo's WiiWare service on September 22, 2008, in the U.S., at a $10 price point. The game was co-developed by Inti Creates and Capcom, with Capcom publishing it. It received an ESRB rating of "EVERYONE" with only "Mild Cartoon Violence" listed as content for parents and gamers to be aware of. How many U.S. Wii owners have reported playing Mega Man 9 since it released, and how many hours have they reported playing it with 1,624 days of data possibly reported? Brew yourself some coffee, and let's take a look! 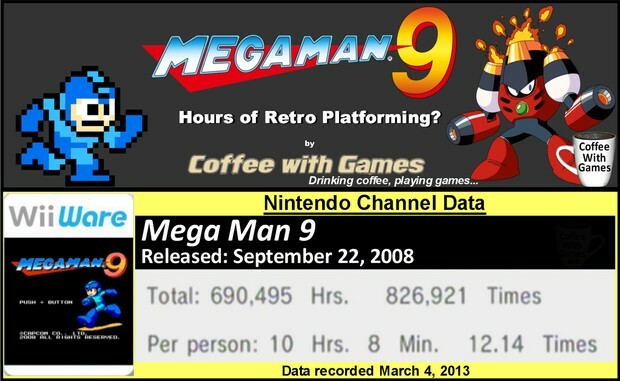 Mega Man 9 has approximately 68,115 U.S. Wii owners that have gameplay data reported through the Nintendo Channel, and the average play-time per day/session is just over 50 Minutes. As the image above shows, Mega Man 9 has almost 700,000 Total Hours of gameplay reported, which makes it the most played Mega Man game on the Wii, based on the Total Hours reported. Like all other WiiWare titles, customer reviews are not available for the game directly on the console, but the game does have an 8.1 out of 10 "User Score", based on 45 ratings on Metacritic.com. The WiiWare version of Mega Man 9 has a "professional" critic review score average of 84.04%, based on 28 reviews on GameRankings.com. The U.S. WiiWare release of Mega Man 9 has made Capcom about $681,150 (before taxes and profit sharing) over the last 4 years, just based on the number of players that have data reported and the game's $10 price point. I mentioned in 2010 that I had never played any Mega Man game for any length of time. Now that we are 2013, that unfortunately still has not changed. Being that I really enjoy platforming games, I don't know why (other than my cheapness) that I don't own any of the Mega Man games. Hopefully, Nintendo gets the Wii U's Virtual Console and eShop issue straightened out quickly. Perhaps after they figure it out, I will look at purchasing a Mega Man game and be able to play it on just the Wii U GamePad, as I have come to enjoy that feature for several Wii U games already. If you have played Mega Man 9, do you know how many hours you played the game? Also, if you're a fan of the series, do you hope Capcom continues the Mega Man series; perhaps with a retro-styled Mega Man 11, or maybe with a totally different styled Mega Man game?